A year after Grajales’ report, Governor General Antonio de Urbiztondo ordered the Cuerpo de Yngenieros or Corps of Engineers led by its commandant and chief Don Nicolas Valdes and commandant Fernando Fernandez de Cordoba to conduct another inspection of the cathedral since Urbiztondo had lost confidence in Grajales. Grajales had made assurances earlier during a meeting with the Cathedral Chapter that no contingencies were needed since the cathedral (after the 1852 earthquake) did not pose any threat to lives and property. In spite of such assurances, on March 6, 1853, a cornice from the media naranja or dome of the cathedral fell down, destroying a part of the cathedral roof. The Cuerpo de Yngenieros made its own examination and came up with an “Estimate of Works” or Presupuesto de las Obras to remedy and reconstruct the areas which suffered damages in the cathedral. 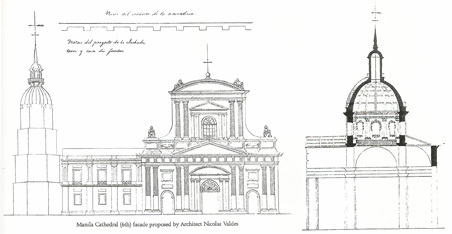 Among their proposals were to demolish the façade, which suffered cracks, to be replaced with a more appropriate, elegant, and dignified form, to replace the dome with a new one partially due to its old decaying wooden frame, to restructure the principal nave for better stability and raise it by one meter, to repair the different ceilings of the interior rooms and to renovate the present ceiling of the principal nave with one more majestic with a lovely stone simulation. The crown or roof of the bell tower was to be replaced with one mas gracioso than the earlier. Likewise, the house or chapter hall located between the bell tower and the cathedral was to adopt a new façade, with better circulation and means of ventilation. The estimated cost of work was 45,500 pesos. By October 1854, bids for the project were submitted. Contractors who joined the bidding for the cathedral renovation and reworks were Don Manuel Asuncion, Don Luciano Oliver who was a renowned architect, Don Antonio Fua, Don Sixto Ejada Obispo, Don Esteban Transfiguracion, and Don Antonio Canals y Llinas, who was the director and owner of the Establecimiento Artistico in Arroceros. Don Sixto Ejada Obispo, who was then the Gobernadorcillo de Mestizos of Binondo and a practicing contractor, won the bidding with the lowest bid price of 45,300 pesos. The project pushed through with the churches of the Archdiocese of Manila contributing half of their collected sanctorum for the work. Funds were also subsidized by the Obras Pias and the Real Hacienda. Upon completion, the cathedral was opened to the public on March 31, 1858. The restored cathedral possessed an entirely new façade. Removed were the pediments and columns framing the side portals and the baroque mouldings framing the high windows over these doorways. Left was a clearer visual space interrupted only by the coupled pilasters that marked each vertical bay. Introduced was a Neoclassic façade, with its architrave and triangular pediment over the main portal. Sculptured figures topped both ends of the main façade’s first level and graced the semi-circular pediment of the upper story. As a whole, the baroque façade of Uguccioni’s cathedral was replaced with a Neoclassic motif. The Cathedral had a new dome. Uguccioni’s truncated or box-like cupola was dispensed with and replaced with a circular or hemispherical dome composed of brickwork. Raised on a drum, the dome had a balustraded lantern, made out of wood and iron, and a spire capped with a weather vane. Valdes’ corps of engineers also replaced the bell tower’s dome with a lanterned dome and spire. Many defects were observed in the restored cathedral, among which were the leaks in the cimborrio which dripped down the main altar and the old rotting wood of the roof frame. To correct these defects, the cathedral underwent another restoration, which amounted to 9,000 pesos. In August of 1862, the Cathedral Chapter vacated the cathedral premises so that work could commence immediately. The restored cathedral opened formally again to the flock on March 19, 1863. “On entering, the principal altar presents a most gorgeous spectacle, being apparently one mass of silver, but, on close examination, we found the only portion that was really so was a thin plating which made a dazzling effect. In a frame above are a number of figures symbolical of our Savior’s Crucifixion – the cross, dice, ladder, spears, and garments…but at first glance, they all looked like hieroglyphics on a freemason’s apron." “There are a number of small chapels, and a very fine dome; but beyond this nothing struck us much, except two very curious pictures. In one, the Virgin Mary was represented standing on a tree in an arbour, with a priest, surrounded by Europeans on one side, and a number of native on the other – all faces presenting an awe struck, wondering expression. The inscription below informed us that this was a miraculous appearance of the Virgin in this island, some hundred years ago, or more. Singular to relate, in the distance a steamer is seen on the sea, smoking and puffing. We thought this accorded strangely with the date – unless, indeed, its appearance there might be accounted for as the effect of another miracle!" From such curious observation, it can be inferred that the Manila Cathedral was indeed adorned with attractive treasures of art and that certain paintings presented an indigenization of forms which was common during the Spanish colonial period. On the night of June 3, 1863, at about half past seven, tragedy struck Manila when a strong earthquake shook its buildings and residents. Many indios and Chinese also died especially those who were in the night market that hour. Many were injured and buried in the tragic ruins that became of the Manila Cathedral and the hospitals of Manila. Because of the ruined state of the Manila Cathedral, services were transferred temporarily in the small chapel of the Venerable Orden Tercera de San Francisco. Many letters and petitions from different quarters, including one from the Archbishop and another from the arquitecto civil Don Antonio Moraleda, called for the demolition and clearing of the ruins of the cathedral. Moraleda made an estimate for the demolition project which he computed at 41,049 escudos. Moraleda’s call to level the ruins was repeated the following year. Yet, the proposal was put on hold in 1866 only to be renewed in 1868. On May 12, 1868, the government architect Vicente Serrano y Salaverri was commissioned to inspect and to undertake a study of the ruins. Serrano’s report dated July 31, 1868 repeated Moraleda’s findings that the cathedral ruins had to be demolished and cleared. On September 5, 1868, Manuel Ramirez y Bazan prepared an estimate for such work. However, it was only in 1870 that a move to finally pursue demolition and clearing of the remaining walls and ruins of the cathedral was made. Consequently, the restoration of the Metropolitan Cathedral commenced.